Jim Rohn, a great speaker and business philosopher, wrote that motivation is a mystery. He said, “Give a lecture to a thousand people. 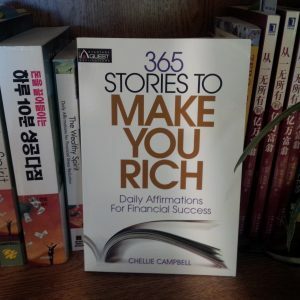 One walks out and says, ‘I’m going to change my life.’ Another one walks out with a yawn and says, ‘I’ve heard all this before.’ Why is that?” He shakes his head in wonder that a millionaire tells a thousand people about a book that started him on the path to wealth, yet very few of them ever get the book. If people are listening to this man talk, and probably paid money to hear him, why wouldn’t they do what he told them to do? He called this a mystery of life. During one session of the Financial Stress Reduction® Workshop, I had twenty-five participants. On the day of the last class, twenty-four of them wrote glowing reviews of the course on their evaluation sheets. The twenty-fifth didn’t come to the last class, but instead left a message on voice-mail that she “didn’t hear anything new” and wanted a refund of her money. Why was that? She heard the same information. Why couldn’t I reach her, too? I really enjoy reading my own pages from “The Wealthy Spirit”. The life lessons I’ve learned in the past are often lessons I need to relearn right now in the present! I am constantly reminded to walk my talk and keep all these principals for living active in my life. I don’t always see it. Then I need other people to share their wisdom with me. For example, I was annoyed because I was feeling like other people were copying my writings and teachings, sending out their own twists to what I said to market their own seminars and teleclasses. Now, I spend a lot of time writing these blog pieces, my monthly newsletters, and various emails and blog posts. So I was a bit in a snit over this. That stopped me in my tracks. “Uhh….” I said sheepishly, thinking maybe I was afraid I was losing business? People were going to other workshops instead of mine? But I quickly came to the realization that I lose nothing when other people get ideas from my work. Haven’t I learned and gotten ideas from other teachers I’ve studied with and other great books I’ve read? “Oh, Louise,” I said, “thank you for that. I see clearly that I lose nothing from other people playing off my ideas. I have plenty of clients and I can only work with about 80 people a year. There’s plenty of business for everyone!” I knew that. I just forgot for a minute. Writer Wilson Mizner said if you copy from one author, it’s plagiarism, but if you copy from many, it’s research.” So here I am copying from Austin, but praising him and giving him credit, too. So I hope that some of my writings inspire you to copy, too. Put your own spin on it and speak about the ideas from your experience. And guess what? That will be original!